A nurse who had close contact with a Liberian Ebola patient skipped quarantine in Lagos and went to her home in the eastern city of Enugu, where she made contact with 20 other people, the government said on Wednesday. Information Minister Labaran Maku said the nurse, herself a suspected case, and her 20 contacts were all under surveillance in Enugu. Naijacrux gathered that while 177 are being quarantined in Lagos where the index case was reported, 21 persons are being attended to in Enugu. Bringing the total number of quarantined patents to 198. Maku explained that of the 198 persons under surveillance, 177 of them are in Lagos while 21 are in Enugu. He said: ?All those who had primary contact have been quarantined. Secondary contacts have also been traced. So far, the number of people that have been traced is 198. ?Of this number, 177 are in Lagos and are being traced. Some are in quarantine, some are being monitored by health specialists.? Meanwhile, the death toll world wide from the outbreak stands at 1,069 and total number of infections 1,975, according to the World Health Organisation. Liberia was hit extremely hard this week, with 71 cases and 32 deaths from Sunday to Monday. Fifty-six deaths and 128 new cases were reported in that same period across all four West African countries affected by the virus. Giving details on the escapee, Maku revealed that she travelled to Enugu from Lagos against instruction not to leave Lagos State. He said: ?The 21 persons in Enugu under watch now is as a result of their involvement with the nurse who disobeyed medical instructions and somehow travelled to Enugu. All those who she was in contact with, including her husband, are under quarantine. The medical team has been able to trace all those who made contact with her.? While warning that government would prosecute anybody found spreading false rumours or unverified reports over the Ebola epidemic, Maku said government was expanding presence of health officers to strategic entry points in the country. ?Health workers are now in all our border units. At all the entry points into this country and exit points, we have port health workers that are working in our airports and seaports. ?We are calling on citizens, specifically, to co-operate. If health workers say you have had contact with A, B, C, don?t move to anywhere, respect that judgment. It is very important. In one or two cases where we have had disobedience, we lost one of them and this one now moved with it to another place (Enugu). ?So we are urging Nigerians, please to help us in making sure that all these messages and appeals we are making, we implement them.? He noted that the Ministry of Health had set up a special committee specifically to take claims from Nigerians who believe they could help and so far ?we have had a lot of reports from Nigerians at home and abroad who come forward to say they have possibility of developing therapies that could help in fighting the virus. ?There is no cure so far, anywhere in the world. Even the trial drug in the US is still a trial drug; it has not been established. ?One of the doctors and research experts that came forward was Dr. Simon Agwale, who has been one of the frontline global researchers on developing vaccines for HIV and other viral diseases. ?He also came forward and said he could help, both in terms of working to develop a vaccine, which he said he has started work on between himself and his fellow experts in the US and he said this is ongoing.? Maku stated that the Minister of Health had given support and directed him to the committee. He also discussed the possibility of certain therapy which could be applied and again that is being discussed. Once it is approved, it could be used.? There was anxiety among residents of Enugu, yesterday following reports that 21 persons have been quarantined in the city for having direct contact with a suspected Ebola patient who escaped from Lagos. Officials of Enugu State Government claimed ignorance of the development but there were fears that the government might be keeping the information secret to prevent panic among residents. The telephone line of the state Commissioner for Health, Dr. George Eze, remained switched off yesterday while another commissioner who was contacted said he was not aware of anybody being quarantined in Enugu. 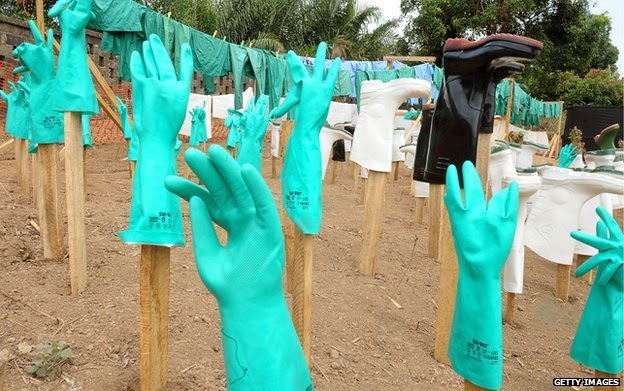 But a medical consultant with the University of Nigeria Teaching Hospital, UNTH, Enugu, told newsmen that some officials of the National Centre for Disease Control, NCDC, in Lagos were in Enugu last week to pick the suspected female Ebola victim who escaped from a quarantine centre in Lagos. The woman and her husband were picked up from their residence at Trans-Ekulu and were immediately taken to Lagos where they have been kept under surveillance. The consultant said about 21 people believed to have had direct contact were being quarantined for close monitoring by officials of the state Ministry of Health, but he was not aware of the hospital.